1. Place cleaned basmati and jasmine rice in a steamable deep cooking utensil, tie screwpine leaves into knots, place it with lemongrass, ginger and garlic over rice. 2. Add salt into coconut milk, stir well. Measure out 1 cup of coconut milk plus 1 cup of water, pour it over rice, place the utensil in a steamer and steam rice at high heat for 10 minutes. 3. Lightly turn the rice with fork or spatula before measure out 1 cup of coconut milk and pour over on rice, use the handle of spatula to poke a couple of holes into rice to get even cooking, steam the rice at high heat for another 10 minutes. 4. Lightly turn the rice again. 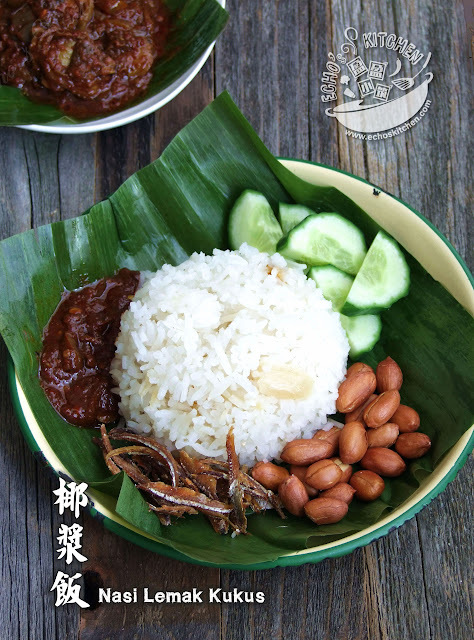 This time, switch off the stove and pour the remaining coconut milk over rice. Let the coconut milk sits in the rice for a good 15-20 minutes before steaming it for another 10-12 minutes at high heat. This is to sort of "marinate" the half cooked rice and gives better coconut-y flavor without forcing out grease in coconut milk. 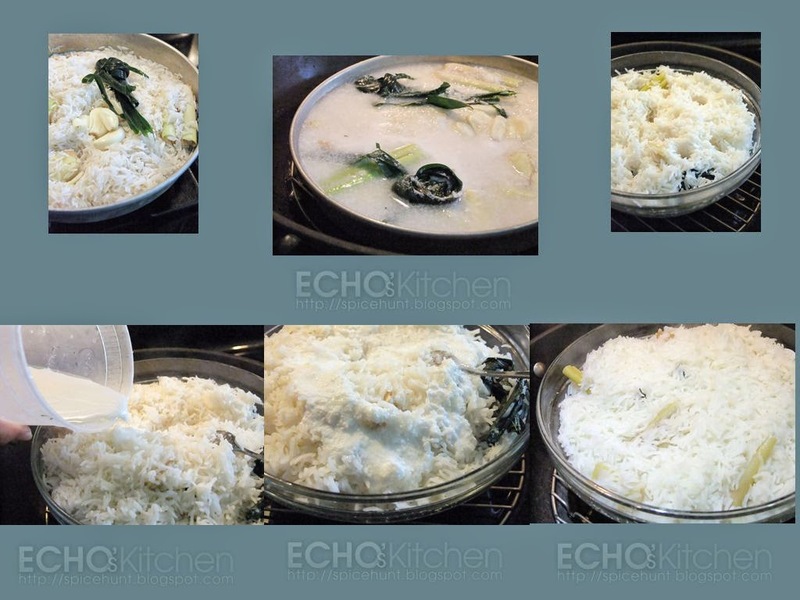 This method produce very fluffy, fragrant and grease-less coconut rice. It stays as fragrant and yummy the next day! 5. In a cooking pot, heat up 2 tbsp of oil and fry the peanut until golden brown, take out, let cold and set aside. Do the same for anchovies. 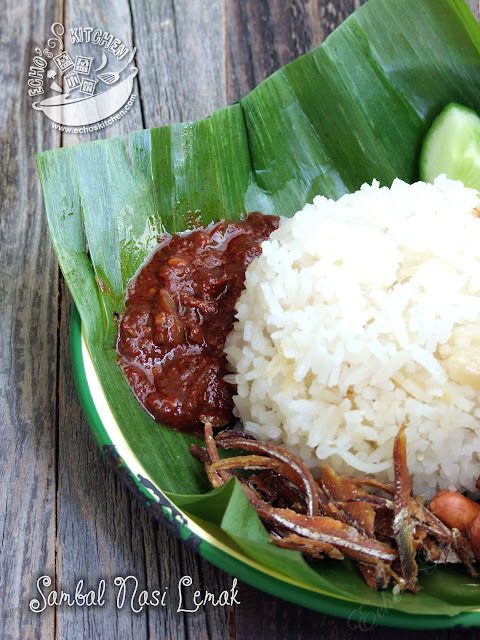 Measure out 1/3 cup of fried anchovies for use in the sambal later. 6. In a cooking pot, heat up 1/2 cup of oil and pour blended spices into pot, cook at medium heat until oil breaks at the edge. Add the sugar first, this will gives the sambal its signature dark red color, continue cooking for 3-5 minutes, season with salt and tamarind juice. 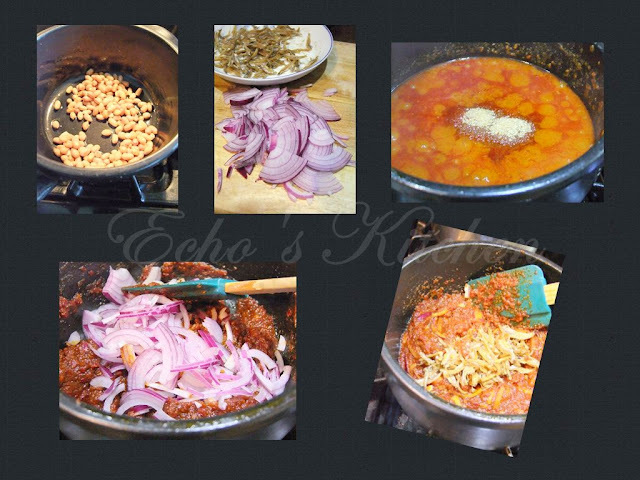 Stir well, add onion and cook until onion softened, switch off the stove, add anchovies into the sambal before serving. 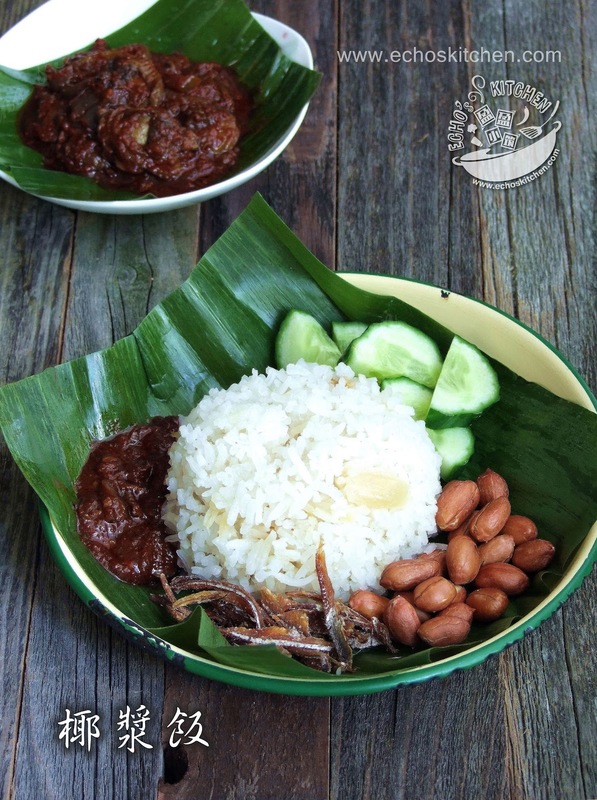 Assemble the coconut rice, sambal and accompaniments, off you go our super yummy lunch!